Luxury Homes For Sale For Cheap? I am greatly concerned about the future of the luxury homes market in Tallahassee and beyond, and I suspect those who must sell high end homes are going to be facing a glut of competition in years to come. In order to clearly demonstrate the basis of my concern, today's article includes research of luxury homes that have been built and sold in Tallahassee. And before you dismiss this as merely a local concern for Florida's Capital City, I suggest you see what I've prepared and ask yourself if this isn't really a problem of national or global reach. I have included three real estate graphs in this article, and I believe they provide an important picture that clarifies the scope of my concern for Tallahassee's luxury homes. For our readers who live and/or are concerned with someplace other than the Tallahassee real estate market, let me suggest that "luxury homes" is relative to your location. In Tallahassee, less than 5% of home sales (typically) are at prices above $400,000, thus I have drawn the line there. If you are in a high end area of California, luxury homes there could be defined at $2M and up. It is all relative to your local market, right? This means luxuy homes for sale downtown Tallahassee are no different than luxury homes for sale 32312 (zillow). Any residential property priced in the top 5% is being used for this analysis. 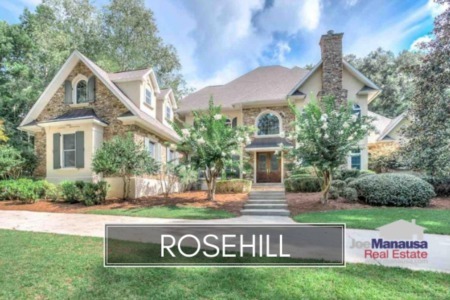 What caused the explosion of luxury home sales in Tallahassee? Who has bought these homes and what is going on in our economy that makes luxury homes affordable to more people? Is the market for these homes sustainable in the future? While I do not have answers to every question, I do have evidence that causes me grave concerns for luxury homes in Tallahassee in the years to come. Who Is Buying Luxury Homes For Sale Downtown Tallahassee? In my recent article about large homes defying the laws of supply and demand, I made an unsubstantiated statement about the cause of the explosion of these luxury homes. I attributed the crazy growth of the top 5% of our market to low interest rates and the manipulation of the mortgage market in 2002 when loan products were created to stimulate the real estate market. 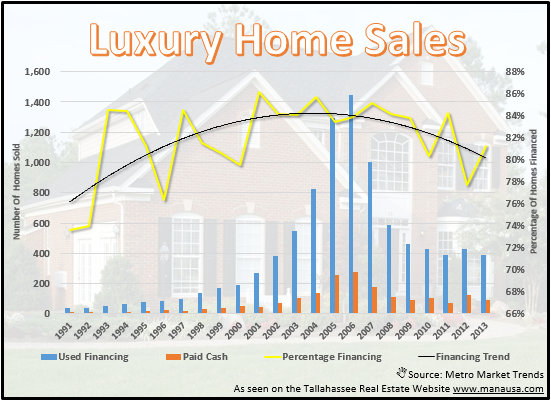 In order to demonstrate evidence of this, I have provided a graph below that shows the majority of homebuyers who purchased luxury homes in Tallahassee used financing, and when you consider the growth of these types of sales, you can arrive at a very disturbing conclusion. When you look at the percentage of homes priced above $400K that were financed during the boom of the housing market (est. 85%), you can get an idea of how many luxury homes in Tallahassee are currently underwater. The typical loan to value during the boom was less than the traditional "20 percent down," thus most people who purchased a luxury home since 2002 are still upside down on their home. Maybe they don't "need" to move, but the demographic for these homeowners says that they "want" to move. If the average length of homeownership in this demographic is 10 years, then we are well into the window in which we should see these homes coming onto the market. It is my belief that owners of luxury homes in Tallahassee have a greater resiliency to challenge the housing market, but they cannot and will not wait forever. This next graph is the most disturbing of all. It should clarify my concern better than words can describe. 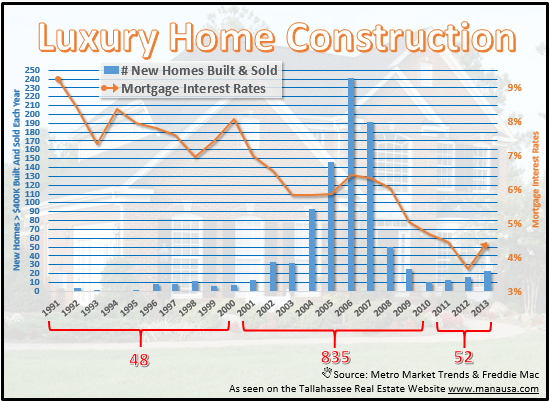 The graph above shows the construction of luxury homes in Tallahassee and compares it with changing mortgage interest rates. The blue bars show the number of homes built and sold each year (measured on the left vertical axis), while the orange line shows the average mortgage interest rate each year (measured on the right vertical axis). As you can clearly see, interest rates have basically fallen each year over that time. This means that the mortgage payment for those financing luxury homes (85% of the purchasers) have become more affordable. So what is going to happen as mortgage interest rates return to normal (double the current rate)? In the 1990s, 48 homes were added to the luxury homes market (see red numbers below the graph). But 10 years later, that number jumped to 835! 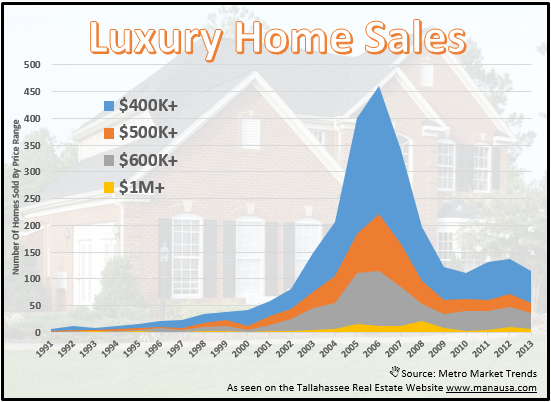 To put that into context, the number of luxury homes built and sold in Tallahassee rose 1640% in just one decade!!! In fact, all the while our market is selling at a far slower rate of sales than in the 1990s, there have been more luxury homes built and sold in the past 2.6 years than in all of the 1990s. Tallahassee went from 48 luxury homes built in the 1990s to 84 luxury homes built each year. You have to ask yourself how the market could support this then, and what will we do with all these high end homes in the future. 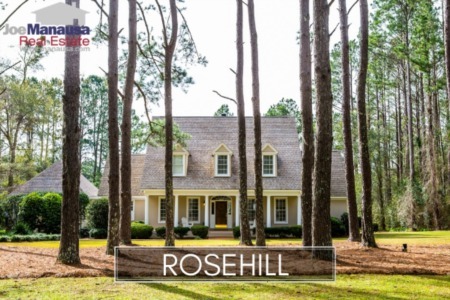 If you believe that the mortgage interest rate market will return to normal (8.54% is the 50 year average rate), then you have to ask yourself where Tallahassee is going to find the people that can afford these homes. Even if rates were never to rise, you have to understand the bulk of these homes were purchased with loan products that no-longer exist (low-money down, interest-only, jumbo loans), so future buyers have to be stronger than past buyers. Has something happened in the Tallahassee economy to bring wealthier people to our market over the past ten years? New jobs? New retirees? I see some positive changes, but nothing that would support a 1640% growth of luxury homes. Ultimately, one of the following must happen (spectacularly) or a combination of all of them to restore the luxury homes in the Tallahassee real estate market. While I do not have a crystal ball, I would venture to say that the US has held interest rates in check for too long and the dollar is now at risk. I would not hold much hope in "low interest rates" being the solution to the luxury homes market in Tallahassee. Unsustainable loan programs helped create the housing market collapse, I suspect we will be smart enough not to allow them to be the solution to this problem. Ultimately, loans were made to people that could not repay them, thus a solution which contains "more of the same" is no solution at all. I believe luxury home prices must fall, as the eventual reality facing homeowners is that they will not be able to sell and regain any equity is realized. It happened in the lower price ranges, it is now going to happen at the higher price ranges. Even as the lower end of the market recovers, the higher end must now pay its due. There have been 481 luxury home sales already in 2013, but we have also seen mortgage interest rates rise 1% over the past few months. I suspect this will slow the sales of our pricier homes and 2014 will drop below 400 home sales, and then much lower in the years to come. Whether it begins in 2014 or a year or two later, higher interest rates will be a thorn in the side for sellers of luxury homes. Right now it looks like a 9 year glut of these homes, but it could be a little better (with a growing economy in Tallahassee) or even worse. If you are interested in luxury homes in Tallahassee, whether as a seller or buyer, you can drop me a note to schedule a time to review your particular situation and needs in order to help determine your best course of action. One small thing I have noticed that is going under reported is that banks are offering their fav clients ( Dr.s, lawyers etc.) zero down loans on Luxury homes. This is in return for gathering all their banking business. Agreed Jim. We're seeing that here now, and it's how things used to be too (before the crazy mortgage market). We all agree that Tallahassee is a wonderful place to live. However its major "industries" are higher education and state and local governments. Obamacare insures that most job growth will be part-time, with a need for affordable housing, not the luxury category. We sure do need to see economic growth to bring in jobs and people to buy these homes. Thanks George.